This courtroom sketch depicts Paul Manafort, centre, during his sentencing hearing yesterday. US PRESIDENT DONALD Trump’s former campaign chief Paul Manafort has been sentenced to nearly four years in prison by a federal judge for tax crimes and bank fraud. Judge TS Lewis immediately came under fire from Democratic lawmakers for imposing what they described as a relatively light sentence on the 69-year-old Republican political consultant and lobbyist. Ellis said that while Manafort had committed “very serious crimes”, he had previously led an “otherwise blameless life”, and the advisory sentencing guidelines calling for 19 to 24 years behind bars were “excessive” and disproportionate to sentences for similar offenses. Prosecutors alleged that Manafort used offshore bank accounts to hide more than $55 million (about €49.1 million) he earned working for the Ukrainians. The money was used to support a lavish lifestyle which included purchases of luxury homes and cars, antique rugs, and expensive clothes, including an $18,500 (€16,500) python jacket. His conviction was a stunning downfall for a man who also worked on the White House bids of Gerald Ford, Ronald Reagan, George HW Bush and Bob Dole. 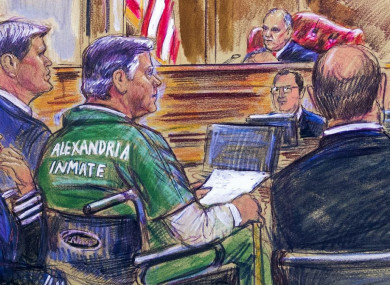 Speaking from a wheelchair and wearing a green prison jumpsuit with the words ‘Alexandria Inmate’ on the back, Manafort told the court that his “life, professionally and personally, is in a shambles”. “I feel the pain and shame,” said Manafort, who the defence says suffers from gout. ”To say that I feel humiliated and ashamed would be a gross understatement,” he said. “I think what I’ve done is punitive,” Ellis said. He sentenced Manafort to a total of 47 months in prison for the eight counts and credited him with nine months of time served. Manafort was ordered to pay $24 million (about €21.4 million) in restitution and a $50,000 (€44,600) fine. Manafort still faces sentencing in a €money laundering and witness tampering case in Washington next week, where the maximum penalty is 10 years and the judge has appeared more sympathetic to prosecutors. Defence attorney Kevin Downing, speaking after the sentencing, said Manafort “accepts responsibility for his conduct”. And I think most importantly, what you saw today is the same thing that we had said from day one — there is absolutely no evidence that Paul Manafort was involved with any collusion with any government official from Russia. Representative Adam Schiff, the Democratic chairman of the House Intelligence Committee, described Downing’s remarks as a “deliberate appeal for a pardon” from Trump, who has denied any collusion with Russia and has denounced the Mueller probe as a “political witch hunt”. “His crimes took place over years and he led far from a ‘blameless life”, Klobuchar said on Twitter. Crimes committed in an office building should be treated as seriously as crimes committed on a street corner. Trump’s former personal attorney Michael Cohen is to begin serving a three-year prison sentence on 6 May for fraud, tax evasion, illegal campaign contributions and lying to Congress. Email “Trump's ex-campaign chief sentenced to almost four years in prison”. Feedback on “Trump's ex-campaign chief sentenced to almost four years in prison”.